Up until recently, we were unable to offer anything that was suitable for sports hall floor protection during exam time. We now recommend Ram Board temporary floor protection for this application. Ram Board is significantly cheaper than druggets which can cost up to £6k for a typical sports hall floor. When Should Ram Board Be Used? When you have a special sports surface to protect from unusual or heavy foot traffic. During exam times to prevent damage to the floor caused by chairs and tables. When you plan to use the sports hall or gym for purposes other than sport such as a school stage production or large event. Durable, easy to handle and store, re-usable and cost-effective, Ram Board is the perfect partner for your sports hall or gym floor. Thought to be the toughest hard floor protection product around, it is the perfect antidote to hundreds of desks, chairs, bags, dirt and foot traffic on sports hall floors and surfaces in school gyms and halls. 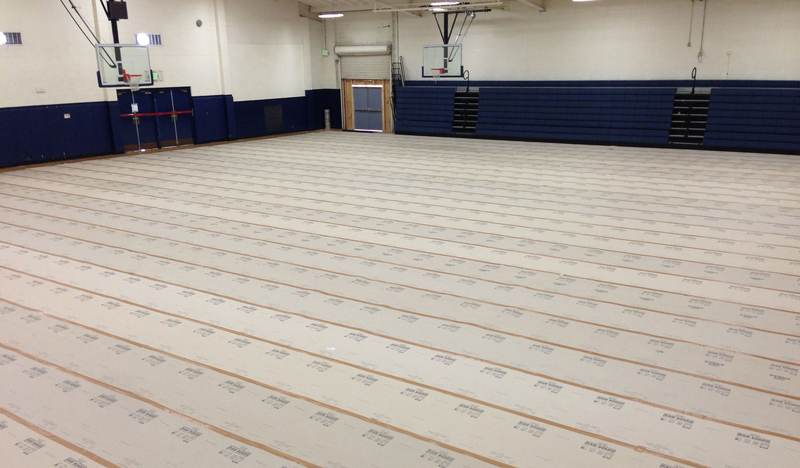 Indoor sports flooring is perfect for exam time with a number of schools having already opted to install it from Trio Plus for the summer 2012 exam season. Designed for contractors working on demanding construction projects, the floor protector can stand the toughest of tests (such as being driven over by a forklift truck) while keeping the hard floor underneath intact and undamaged. This provides total peace of mind that once the exams or special event is over, the expensive sports hall floor is uncovered undamaged and unmarked. Ram Board lays fast and flat so there is no need to make sports areas off limits in the weeks leading up to the first exam. As it is supplied on rolls, it is easy to apply and transport, meaning it can be quickly used to cover large areas of floor including indoor basketball and five-a-side pitches. Made from 100% recycled materials, Ram Board is wholly environmentally friendly and has won awards in testament to this fact. It is made from cardboard, paper, ply-fibres and reinforcers. As the number one indoor sports hall floor protection product in America, it is the preferred brand of many architectural firms, several of whom have named Ram Board in their project specs for by huge brands including Wal-Mart. Whatever the surface, we recommend Ram Board is best cut with a utility knife for a perfect fit. Heavy duty construction grade tape should be used on the seams. Please note that the curing rate when tape is applied may vary.